Drop ceilings are common in many office buildings. A drop ceiling is a lower ceiling placed below the structural ceiling. The drop ceiling has many names like false ceiling, suspended ceiling, grid ceiling, or a drop in/out ceiling. Drop ceilings are a common feature in commercial and residential construction. The initial intention of drop ceilings were to conceal the building’s infrastructure. The electric wiring, piping, or ductwork are hidden by placing a secondary ceiling with access for repairs. Some buildings use the drop ceiling to conceal the fire sprinkler systems without hindering functionality. On the other hand, the drop ceiling may serve to hide any problems or damage to the structural ceiling. The commonly found drop ceilings are basic white tiles. Although modern design offers many new options in sizes, colors, and materials. Some designs are more innovative with visual effects, shapes, patterns, and textures. Many designs and custom ceiling tiles are available at a lower cost than in previous years. An early goal of the drop ceiling is noise control and balance. Noise balance is an important factor in maintaining a productive work day. Too much noise can distract employees and a quiet office may seem boring. Over time, drop ceilings has improved in the function of acoustic balancing. Some new drop ceilings have added insulation to help balance the noise in the space and adjacent spaces. Concealed grid system is a less common type of drop ceilings which is a method of interlocking panels and splines. This method is ineffective because access to the building’s infrastructure is difficult and possibly cause damage. That problem has been addressed by place a panel that can be easily removed to disengage the other panel from the grid. If a panel is damaged while removing for access, a replacement panel is difficult to find due to lack of demand. Fire safety is an important facet to construction. Many ceiling tiles are constructed from plastic, mineral fibers, tin, or fire-rated wood to maintain fire safety standards. Ceiling tiles can reinforce fire resistance bring the building up to code. Drop ceilings with easily removal tiles has an advantage of instant access to the infrastructure. In addition, a drop ceiling can allow for layout changes and edit. The wiring, piping, and ductwork is hidden beneath the drop ceiling able to be placed in smaller offices. This allows smaller offices to be construct and dismantled with relative ease. Renovation of a space can be a costly endeavor. A drop ceiling is a great way to cut renovation and HVAC cost. Concealing the many important structural features is a cost-effective way to create a clean aesthetic. A drop ceiling does have some disadvantages. Ceiling heights are reduced due to clearance needed for wiring, piping, light fixtures, and ductwork. There are set forth minimum clearance required by building codes. 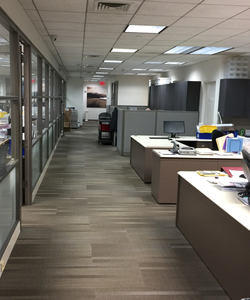 A direct-mount grid is a great option for an office space with constricted headroom. Drop ceiling are available in a variety of styles and materials. The drop ceiling can benefit a space in many ways including cost-effective renovations. Although if ceilings height are a concerns, a drop ceiling may be a problem. 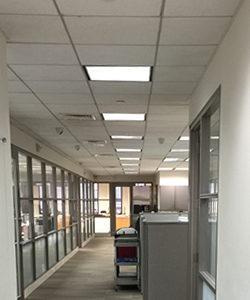 If you have questions about drop ceilings in your office, or finding the most attractive drop ceilings – Contact us. We can guide you through your office search.